Tysabri has multiple personalities – no, just kidding. But it is known by several names. One of the disease-modifying treatments for MS, it was first known under the brand name of Antegren. 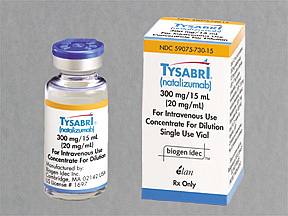 Now natalizumab, (the chemical name), is called Tysabri. There is still much concern around this particular immune-modulating drug. The company, Biogen Idec Inc. produces the antibody-based drug along with Elan Corp. In fact just recently, two patients developed the condition PML (progressive multifocal leukoencephalopathy). That's quite a mouthful isn't it? PML is no laughing matter. Even though it is rare, it is also a potentially fatal condition. The FDA issued an updated Safety Alert for natalizumab. Click here to read more about it. This link will open in a new window. “Late Thursday, Biogen reported in a regulatory filing that it had received word two more cases of PML, an extremely rare but dangerous condition, had been acknowledged in Tysabri users. Both of the patients are in Europe. Biogen said both patients were alive and stable. One patient remains hospitalized, while the other is recuperating at home. Both received blood-plasma transfusions to flush the drug from their systems. Taking Tysabri - Yes or No? Cir's doctor has suggested he consider taking this treatment more than once. He has also been honest with us about the side effects. PML is a rare viral infection of the brain. According to the statistics, one in 1,000 will possibly develop the condition. But once you do get it, it is incurable and could lead to death or severe disability. (This result has changed based on certain criteria being met). To read the form given to each patient before starting the treatment and before receiving the infusion click here. This is a pdf file from the FDA site. It will open in a new window. We talked it over each time the doctor suggested trying this disease-modifying drug. The fact that it is only taken once every month was very tempting for Cir. But the statistics were a risk neither he or I was willing to take. Taking natalizumab increases your chance of getting a rare brain infection that usually causes death or severe disability. This infection is called progressive multifocal leukoencephalopathy (PML). If PML happens, it usually happens in people with weakened immune systems. No one can predict who will get PML. Sorry, but no thanks. We're not ready to take that chance. UPDATE: Guess what? Cir changed his mind - yes go here to read about it. If you'd like to read more about this treatment before you make your decision, click here for Part 2.